Robots have begun, or are poised to begin, flipping burgers, mixing salads, making espressos, delivering pizzas and even greeting guests in foodservice establishments around the world. These intelligent machines have brought with them not only a wealth of capabilities that are superior to their human counterparts, but also questions about how they will work alongside — or potentially displace — flesh-and-blood foodservice employees. Operators say robotics could redefine the roles that human employees play in the workplace, while potentially helping to improve retention and reduce labor costs. On Wednesday, for example, Yelp Eat24 announced plans to use autonomous food-delivery robots in San Francisco’s Mission and Potero Hill districts, eventually expanding the service citywide. 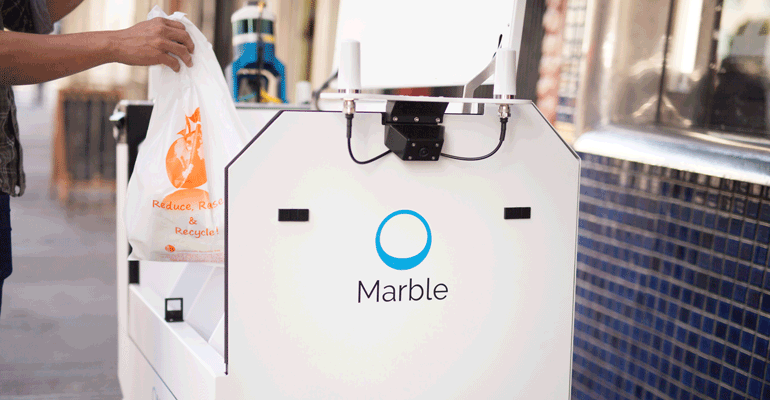 Using technology similar to self-driving cars, the mobile cargo units, developed by tech startup Marble, navigate sidewalks. Domino’s Pizza is also testing the use of pizza delivery robots in Europe and New Zealand. The San Francisco-based quick-service chain Eatsa is growing across the country, offering a modern take on the automat. Guests order via iPad and pull their food from a glass case without the hassles of human interaction. Julia Collins, co-CEO and co-founder of Mountain View, Calif.-based Zume Pizza, is among those embracing the use of automated technology in restaurant kitchens. 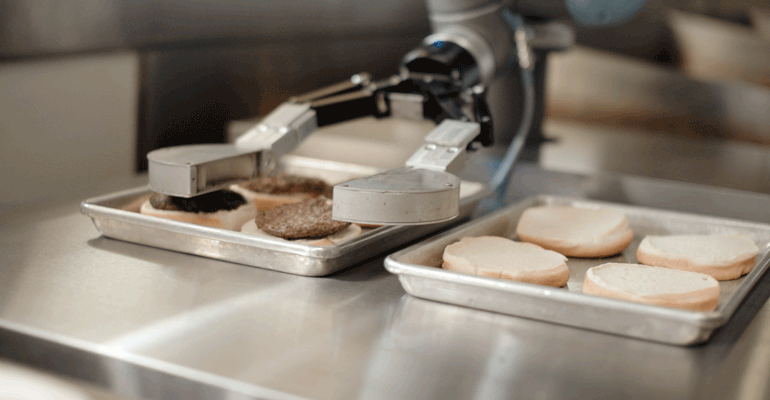 Employing robotics reduces labor costs, she said, which allows the company to use more high-quality ingredients. Five robotic machines in Zume Pizza’s kitchen work alongside human employees, performing such functions as saucing the pies, placing them in the ovens and slicing them when they are done. Human workers still roll out the dough and place toppings on the pies, although eventually Collins said the company envisions automating the entire pizza-assembly process. “Employing a team of robots to work alongside our staff is extremely cost-efficient,” she said. “We’re able to spend only about 14 percent of our budget on labor, compared to 18 percent for the typical restaurant operation. Zume Pizza is able to produce 288 pies per hour using robotics, which Collins said is about double the capacity of a typical pizzeria. Robots can be used to perform some of the more mundane and potentially dangerous kitchen tasks, such as reaching into 800-degree ovens or picking up heavy sacks of flour, she said. But more creative functions, such as tasting and recipe development, “will always be done by humans,” she said. She said all Zume workers receive full medical insurance and “highly competitive” wages, along with ownership of shares in the company. John Miller, chairman of Cali Group, parent of the CaliBurger chain, agreed that robotics have the ability to transform the restaurant industry. Pasadena, Calif.-based CaliBurger, which operates in 12 countries, has plans to roll out a robotic kitchen worker called Flippy to 50 locations worldwide beginning early next year. “We believe that Flippy will improve the daily working life of our kitchen staff, thus helping retain talent and reducing labor costs of having to potentially replace hard workers,” says Miller said. Miller said Flippy, which is designed to flip burgers on a grill and then place them on buns, is expected to increase productivity by about 50 percent, to 300 burgers per hour. Flippy’s creator, Miso Robotics, which is backed by Cali Group, has designed the system so that it can learn additional tasks, including chopping, frying, prepping and finishing plates. Miller said that robots can not only take over some of those repetitive tasks, but can also use computer vision and sensors to perform more sophisticated functions. “There is great potential for our robot assistants to detect operating errors and pathogens in real time and fully automate ordering and cooking processes,” he said. Asked if he was concerned about criticism that robots are replacing human workers in the foodservice industry — much as robots have done in factories and warehouses — Miller said he is not. By using robots for mundane tasks, chefs may be able to spend more time on menu experimentation and creation, said Miller, while kitchen staff might be trained to operate the robotics systems and master other capabilities needed in the kitchen. Dave Zito, CEO of Miso Robotics, said the industry has just begun to tap the potential of automation and artificial intelligence in the workplace. The cost of installing Flippy was not immediately available. Previously, CaliBurger said the company was working with its customers to determine the best pricing model. 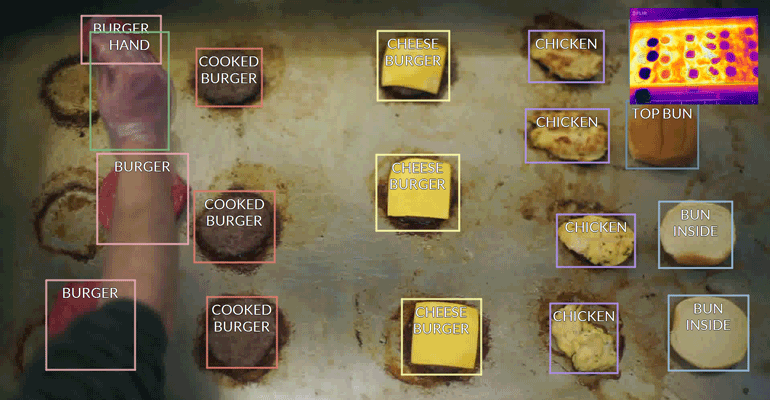 Some automated foodservice technologies appear poised to displace entire restaurant visits. 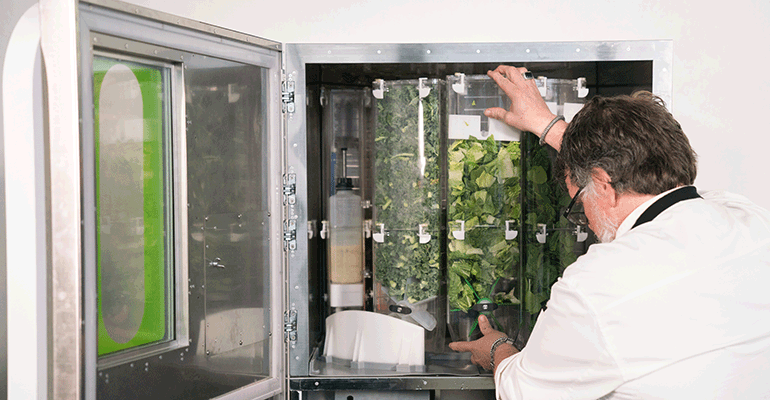 Galvanize, a Denver-based network of shared workspaces operating around the country, in April became the first to install Sally, a salad-making machine that will augment a public café in the ground floor of the company’s San Francisco location. “It’s a good solution for places like us, that don’t really have an option for salads,” said Kate Shillo, manager of Galvanize Ventures, which invests in start-up companies and has backed Chowbotics, the maker of Sally. Shillo said she doesn’t perceive Sally to be displacing human foodservice workers since the café did not offer salads before it deployed the machine. Instead, it adds a new foodservice component to a venue that otherwise primarily offered beverages and baked goods. The idea is that Galvanize members can stay on-site to grab a quick meal. If Sally proves successful at the San Francisco Galvanize location, it could be deployed at other Galvanize sites around the country, said Shillo. Sally is stocked with prepped ingredients stored in individual canisters inside the machine, and can make about 45 salads before it needs a refill, which is done by human workers. Users can select from a pre-programmed list of salad varieties or create their own salad combinations. Kelly Olazar, chef de cuisine at Chowbotics, said the company has plans to create additional machines that can dispense hot foods, such as Mexican or Chinese dishes. In addition, it is exploring the possibility of creating a machine that would dispense hot breakfast items, a feature that has been requested by hotel operators. Olazar said Sally offers several advantages over traditional salad bars in addition to the reduction in labor needed. 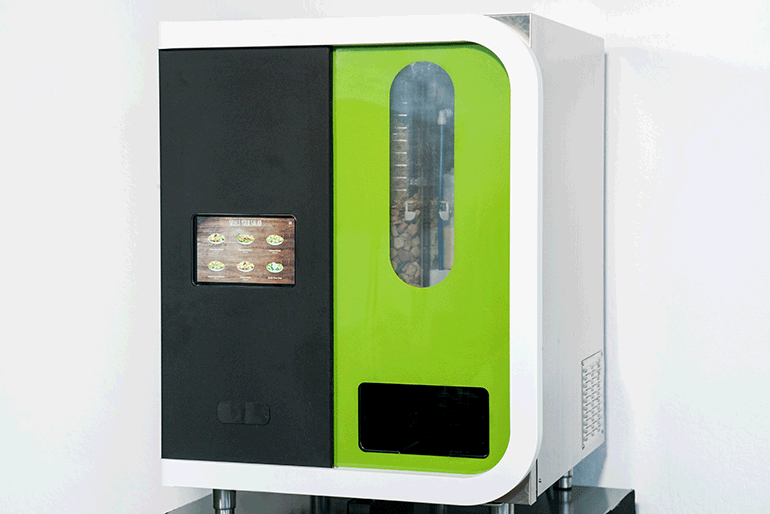 The machine prevents cross-contamination of ingredients and maintains proper temperatures, for example, which helps manage food costs and reduce waste. Sally costs $30,000 to purchase, or can be leased for $500 per month, a spokeswoman for Chowbotics said. Robots have also found a place in the front of the house. 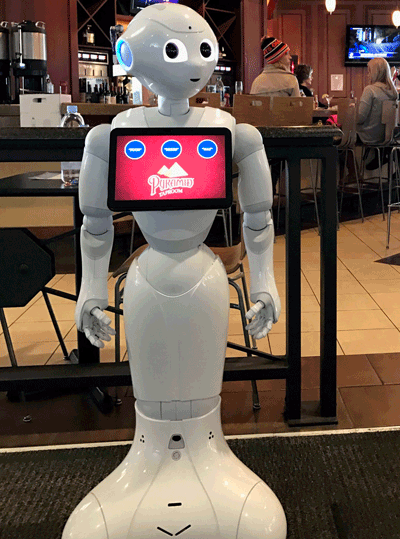 HMSHost, the airport concessions provider, deployed a robot named Pepper at the Pyramid Ale Taproom at the Oakland International Airport in California as a test earlier this year to engage passers-by, offering guidance on food and drink selection. The 4-foot-tall robot, with large, expressive eyes and lifelike movements, also displays a screen that travelers can use to help navigate the airport. Pepper gives the restaurant’s employees more time to focus on serving customers, said Lina Mizerek, a spokeswoman for HMSHost. SoftBank Robotics, the maker of Pepper, has rolled the robot out to several retail venues in Japan during the last two years. The robots sell for about $2,000, but can users can subscribe to monthly maintenance, insurance and updates that add up to about $18,000 to $20,000 over a three-year period, according to reports.